Tuesday March 26, 2019 - Two of Nairobi County staff members will have to spend two years in jail each after they were busted receiving bribes. 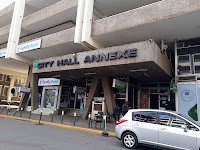 According to the Office of the Director of Public Prosecutions (DPP), the two unnamed employees of Nairobi City County were charged with corruptly soliciting bribe of Ksh 165,000. The DPP further revealed that they, however, received a bribe amounting to Ksh 80,000 and were charged with conspiracy to commit an offence. They were therefore sentenced to 24 months in jail or pay a fine of Ksh 210,000. "Two employees of Nairobi City County Government charged with corruptly soliciting bribe of sh 165,000, receiving bribe of sh 80,000 and conspiracy to commit an offence found guilty and each fined total of sh 210,000 or 24 months jail," posted DPP. This comes even as many Kenyans in high places still walk freely after looting billions of taxpayers’ hard earned money with the latest scandal being the Arror and Kimwarer dams’ scandal where Deputy President William Ruto’s friends are accused of ‘eating’ billions meant to construct the dams.